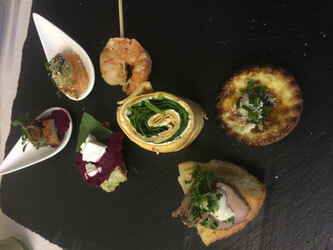 This is my new Canapés menu for a client of mine. In my past life of outside catering this was part of my work. I have kept a client who supports my new career. Once a month I provide Canapés for 60 to 80 guests. My invoice helps me pay the bills & enables me to use the time in the month to do my courses and so to put my grand plan into action. Beetroot with chorizo, Mackerel & lemon thyme. A ciabatta crostini with Beetroot, crumbled feta & basil. A Tiger prawn skewered with garlic, ginger & lemon. A sweet chilli wrap with rocket, watercress and spinach with cream cheese. Yorkshire pudding with creamy horseradish & parsley. A Parmesan tartlet with chives.